Potential future demand for places in them. As one of its creators said in the following BBC news video, the Atlas is designed to simplify the decision-making process for families; all the information comprised in the map is available in various other places but has not – until now – been contained in a single, easy-to-understand location and application. In other words, the London Schools Atlas compiles multiple data points and presents them in a single place to highly motivated parents. It is this function and value – compiling and simplifying complex processes or information – that many other student and parent-targeted apps and sites also aspire to. This compilation and simplification service is also, in many respects, a traditional function of the education agent or other trusted intermediaries in international education. Possibility U mimes the way students think (e.g., “I know this college, and I like what it has to offer, but I want to see if there are other, similar options that suit my goals and budget even better.”). Its algorithm was developed using data based on real human inputs on what matters to students when they choose a university, and this is what makes it so interesting. 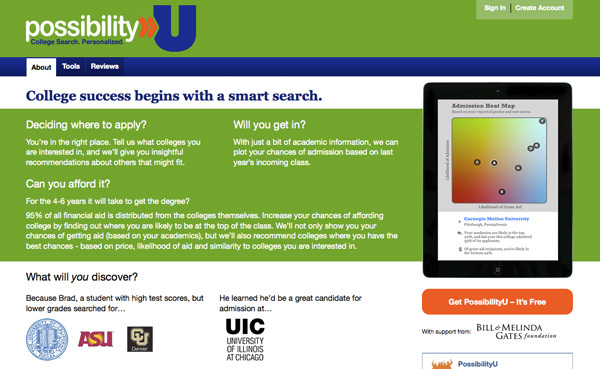 University Pages is a good example of the way data is helping institutions and students to connect more directly and organically. By sharing information on LinkedIn, students and institutions – theoretically at least – have a better chance of matching themselves to each other. And again, student-institutional matchmaking has traditionally been a strong selling point for agents. So, where does this place the agent? Many agents watch the emergence of such school selection products carefully. And for some, the question naturally arises as to whether the increasing range of student information resources online could change or reduce the role played by education agents. But it is no doubt also true that some students will find the information and services they need online and that this may reduce or eliminate their need for additional support or services from an agent. Technology is a dramatic and often disruptive change agent in many industries, and one that requires a thoughtful and strategic response. The travel industry is a good example, and one with some parallels to international education, of a business that has been dramatically affected by technological change. It also provides some important lessons for responding and adapting to new challenges (and opportunities) in a rapidly changing marketplace. In the case of the travel industry, for example, there are still travel agencies, but far fewer than before the creation and wide use of sites such as Travelocity and Expedia. Those that have survived have adapted and changed their services. This owner adds that “[travel review and booking] sites aren’t policed very rigorously” and uses his in-depth knowledge to add a level of security to customers buying holidays. The article also notes that successful travel agencies are there when customers need them – when something has gone awry with their flight or trip, for example. The Business Insider article contends that our knowledge economies are increasingly creating an upper tier of wealthy earners and consumers. In many markets, these consumers include internationally mobile students and their families. Consumers like these will be willing to pay a premium for personalised, extra services… the human touch and on-the-ground expertise that education agents can provide that online information services simply cannot. to innovate, embrace, and harness the power of technology in order to provide a valued, relevant service. If you have a comment about your own experience as an agent and the increasing use of online information and data-driven services for students researching study abroad, we’d love to hear from you in the comments section below. This entry was posted in Africa, Agents, Asia, Australia/Oceania, Europe, Middle East, Most Popular, North America, Regions, South & Central America, Technology, United Kingdom, United States and tagged youth travel, student recruitment, undergraduate student recruitment, recruiting transfer students, tertiary education overseas. More information never translates as more or better answers. In fact, in many respects, it serves only to muddy the waters and further confuse the consumer. Here in the States we’ve had numerous online services and web sites which narrow a search or minimize research or indentify options, Possibility U just happens to be the latest and garner attention accordingly. As some commented in the article (quite well done by the way), there will no doubt be a surge in clientele for those agents who truly focus on the individual, spend time learning their personal needs and have a robust portfolio of suitable matches to propose. Just might make us all work harder and reward those who really know their stuff. Think for some institutions international managers’ positions rely upon in country agents whether that be agent office visits, events, training, management etc.. Obvious question from the article is how do prospective candidates, families, counsellors etc. find the institutional website in the first place, how long is the ‘application’ process (e.g. can be up to two years) and who informs them on visas and local career guidance? Administrative processes or procedures for analysis of marketing or promotions between initial interest and commencement have been very blunt e.g. agent application targets, ‘intuition’ etc.. which does not suggest deep analysis? With multilingual digital/SEO, cooperation across organisational boundaries with in country agents (websites/social media), institutions can have a virtual presence in market all year round (with analytics showing referrals from agent websites etc.). Neither organisations nor personnel are an island in the digital world.